Comparison between simulated and experimental distance distributions. Simulations of the distance distribution probability for the six spin-labeled pairs in the IF (cyan) and OF (magenta) states performed with MMM2015 with the rotamer library at ambient temperature (dotted lines as in Figure 1) and with the rotamer library of MMM2013 simulated at 175 K (dashed lines). 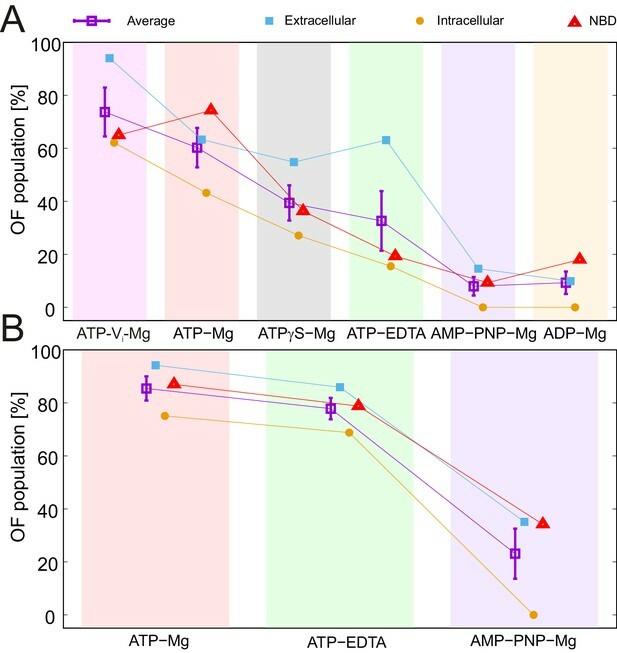 The experimental distance distributions on nucleotide-free (apo, black solid line in upper plots) and ATP-Vi-Mg (black, solid line in lower plots) states are taken from Figure 2. Transparent cyan and magenta rectangles outline the range of experimental distances characteristic of the IF and OF conformations, respectively. 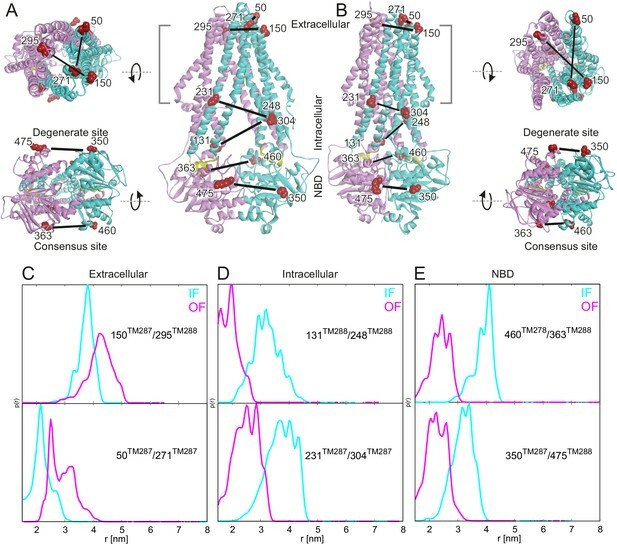 Hoechst 33342 stimulated ATPase activities of wildtype TM287/288 and spin-labeled mutants reconstituted into proteoliposomes. Stimulation of ATPase hydrolysis of wildtype TM287/288 and six spin-labeled mutants reconstituted into proteoliposomes was determined in the absence (basal activity) and in the presence of 50 µM, 100 µM and 150 µM Hoechst 33342 at 50°C. 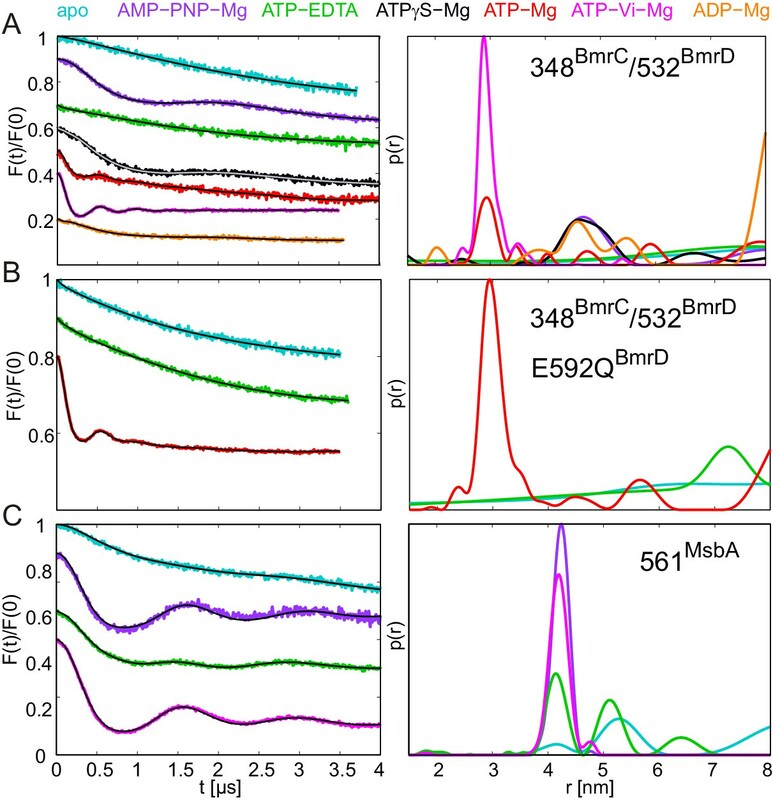 Data were normalized to the basal ATPase activity of reconstituted wildtype TM287/288. The error bars are standard deviations of three technical replicates. 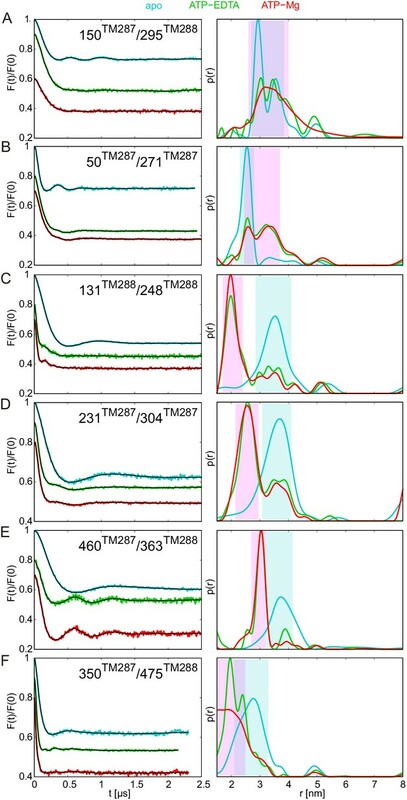 Primary DEER traces of spin-labeled pairs in wildtype TM287/288. Q-band DEER traces [V(t)/V(0)] with the fitted background using homogeneous stretched exponential decay with dimensions of 1.5–3 for the six spin-labeled pairs engineered into wildtype TM287/288. Color code as in Figure 2. (A and B) Extracellular pairs 150TM287/295TM288 and 50TM287/271TM287. (C and D) Intracellular pairs 131TM288/248TM288 and 231TM287/304TM287. (E) NBD pair 460TM287/363TM288 monitoring the consensus site. (F) NBD pair 350TM287/475TM288 monitoring the degenerate site. 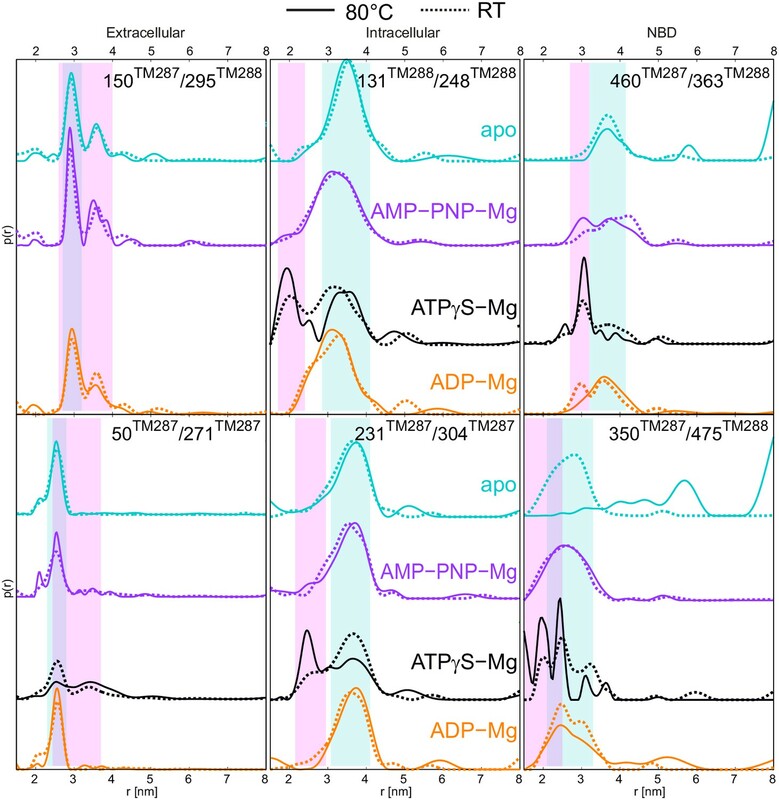 The data of the apo and AMP-PNP-Mg states of the four pairs 150TM287/295TM288, 131TM288/248TM288, 460TM287/363TM288, 350TM287/475TM288 in the wildtype transporter are taken from (Hohl et al., 2014). DEER analysis of TM287/288 in proteoliposomes. Q-band DEER trace [V(t)/V(0)] with the background fit (left), background corrected DEER trace [F(t)/F(0)] with fitted distribution function (center) and the corresponding distance distribution normalized to the area (right) for the spin-labeled pair 131TM288/248TM288 in wildtype TM287/288 reconstituted into polar E. coli lipids and egg phosphatidylcholine. The data of the apo and AMP-PNP-Mg states are taken from (Hohl et al., 2014). 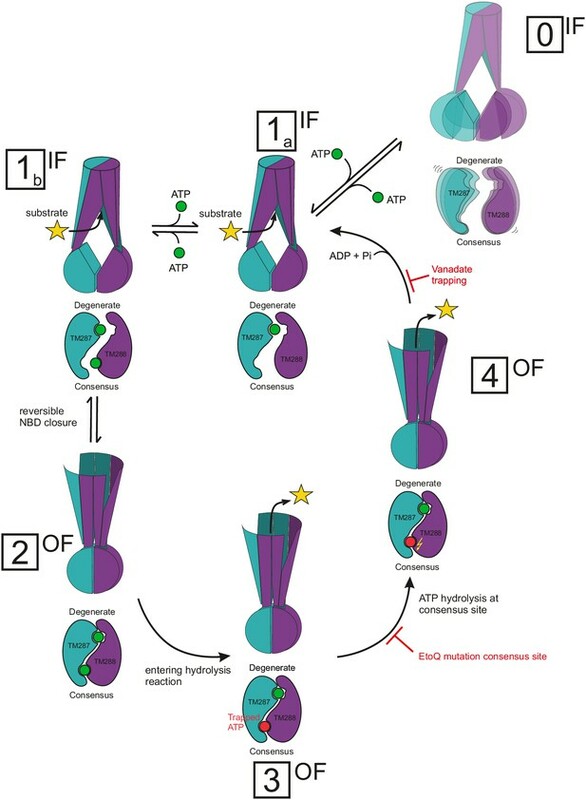 DEER analysis of spin-labeled pairs in wildtype TM287/288 with additional nucleotide analogs and ADP-Mg.
Q-band background-corrected DEER traces [F(t)/F(0)] with fitted distribution function (left) and corresponding distance distribution (right) for the six spin-labeled pairs engineered into wildtype TM287/288. 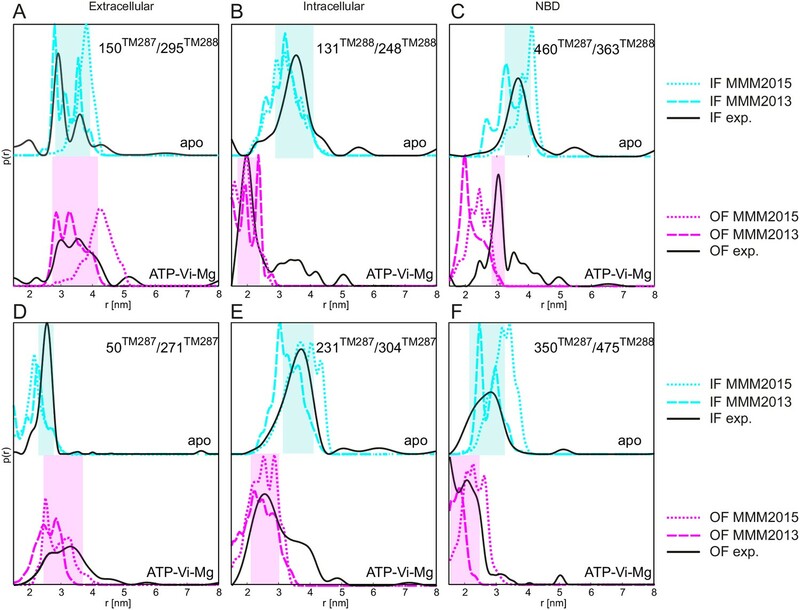 The upper distance distributions correspond to those presented in Figure 2, the bottom distributions to the additional nucleotide analogs and ADP-Mg. (A and B) Extracellular pairs 150TM287/295TM288 and 50TM287/271TM287. (C and D) Intracellular pairs 131TM288/248TM288 and 231TM287/304TM287. (E) NBD pair 460TM287/363TM288 monitoring the consensus site. (F) NBD pair 350TM287/475TM288 monitoring the degenerate site. The data of the apo and AMP-PNP-Mg states of the four pairs 150TM287/295TM288, 131TM288/248TM288, 460TM287/363TM288, 350TM287/475TM288 in the wildtype transporter are taken from (Hohl et al., 2014). DEER analysis of wildtype TM287/288 in the presence of 2.5 mM or 14 mM ATP and 2.5 mM EDTA. 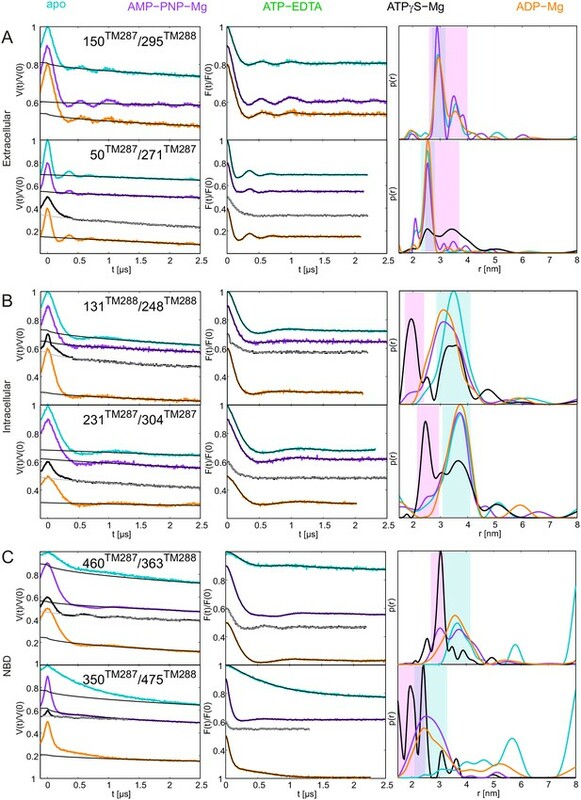 Q-band DEER traces [V(t)/V(0)] (left), background corrected DEER traces [F(t)/F(0)] with fitted distribution functions (center) and corresponding distance distributions (right) for three spin-labeled pairs in wildtype TM287/288: extracellular pair 150TM287/295TM288, intracellular pair 231TM287/304TM287 and NBD degenerate site pair 350TM287/475TM288. The light and dark green traces were obtained with 2.5 mM EDTA and 2.5 mM or 14 mM ATP, respectively. Primary DEER traces of spin-labeled pairs in TM287/288 carrying the E-to-Q mutation. Q-band DEER traces [V(t)/V(0)] with the fitted background using homogeneous stretched exponential decay with dimensions of 1.5–3 for the six spin-labeled pairs engineered on the E-to-Q mutant. Color code as in Figure 4. (A and B) Extracellular pairs 150TM287/295TM288 and 50TM287/271TM287. (C and D) Intracellular pairs 131TM288/248TM288 and 231TM287/304TM287. (E) NBD pair 460TM287/363TM288 monitoring the consensus site. (F) NBD pair 350TM287/475TM288 monitoring the degenerate site. 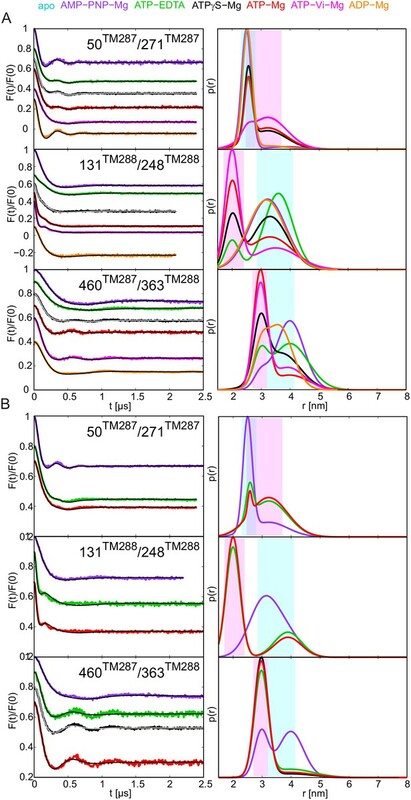 DEER analysis of spin-labeled pairs in TM287/288 carrying the E-to-Q substitution with additional nucleotide analogs. Q-band background-corrected DEER traces [F(t)/F(0)] with fitted distribution function (left) and corresponding distance distribution (right) for the six spin-labeled pairs of TM287/288 carrying the E-to-Q mutation. The upper distance distributions correspond to those presented in Figure 4, the bottom distributions to the additional nucleotide analogs AMP-PNP-Mg and ATPγS-Mg. Color code as described in the figure legend. (A and B) Extracellular pairs 150TM287/295TM288 and 50TM287/271TM287. (C and D) Intracellular pairs 131TM288/248TM288 and 231TM287/304TM287. (E) NBD pair 460TM287/363TM288 monitoring the consensus site. (F) NBD pair 350TM287/475TM288 monitoring the degenerate site. Parameters of the two-Gaussian fit. Two-Gaussian fit DEER analysis of three selected spin-labeled pairs of TM287/288. 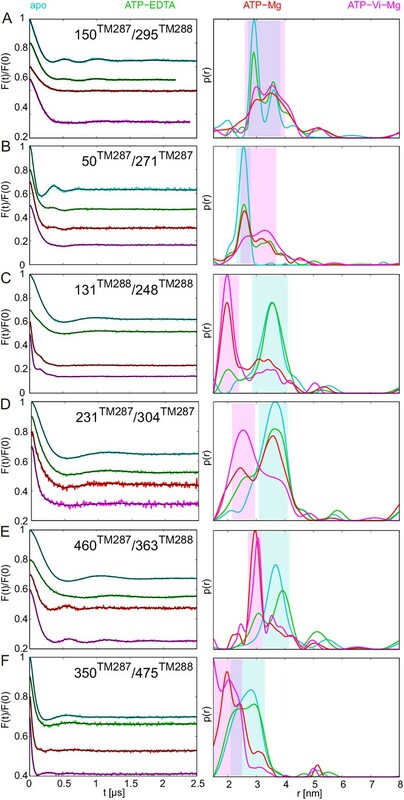 Q-band background-corrected DEER traces [F(t)/F(0)] with fitted distribution function (left) and corresponding distance distribution (right) for the three selected spin-labeled pairs engineered on the wildtype TM287/288 (A) and the E-to-Q mutant (B). DEER analysis of wildtype TM287/288 snap frozen from 80°C. Q-band DEER traces [V(t)/V(0)], background corrected DEER traces [F(t)/F(0)] with fitted distribution function and corresponding distance distributions (from Figure 6) for the six spin-labeled pairs engineered on wildtype TM287/288 incubated at 80°C and snap frozen in isopentane. (A) Extracellular pairs 150TM287/295TM288 and 50TM287/271TM287. (B) Intracellular pairs 131TM288/248TM288 and 231TM287/304TM287. (C) NBD pair 460TM287/363TM288 monitoring the consensus site and 350TM287/475TM288 monitoring the degenerate site. 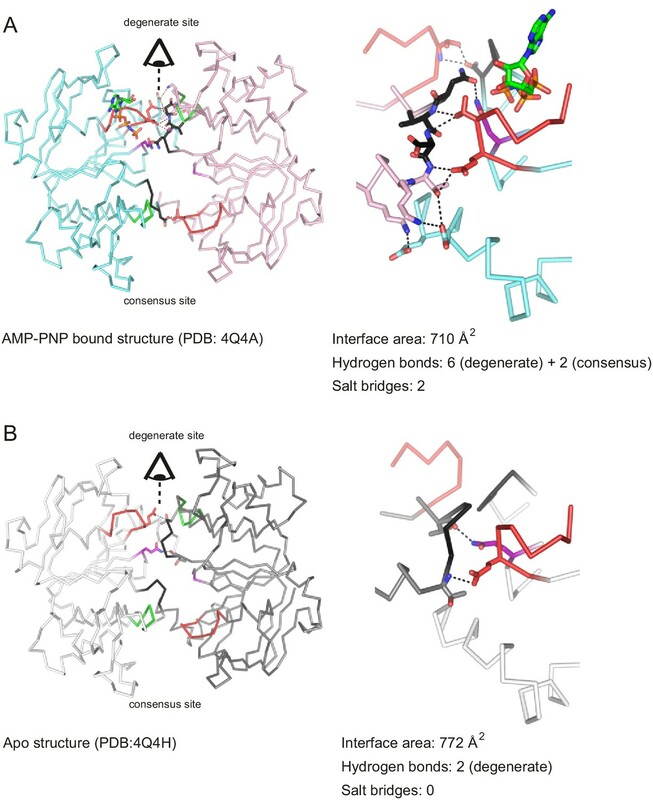 DEER analysis of BmrCD and MsbA. 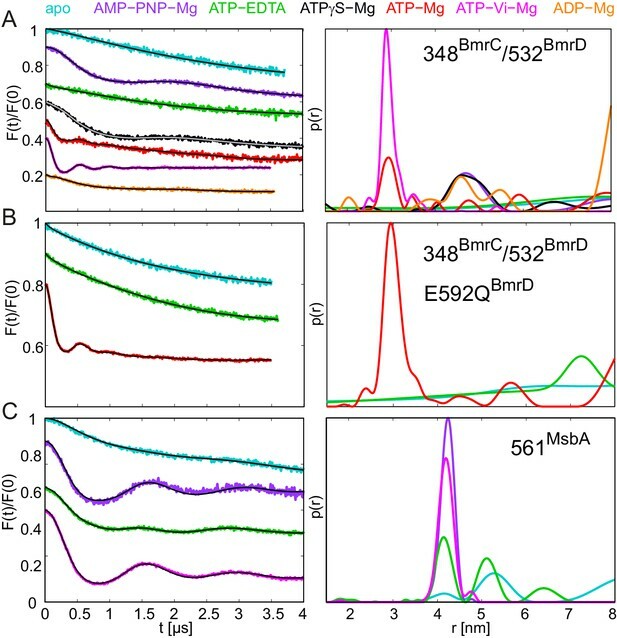 Q-band primary DEER traces [V(t)/V(0)] with fitted background for the spin-labeled pair 348BmrC/532BmrD in (A) wildtype BmrCD and (B) in BmrCD containing the E-to-Q mutation; (C) data for the spin-labeled pair 561MsbA in wildtype MsbA. Color coding as in Figure 9. 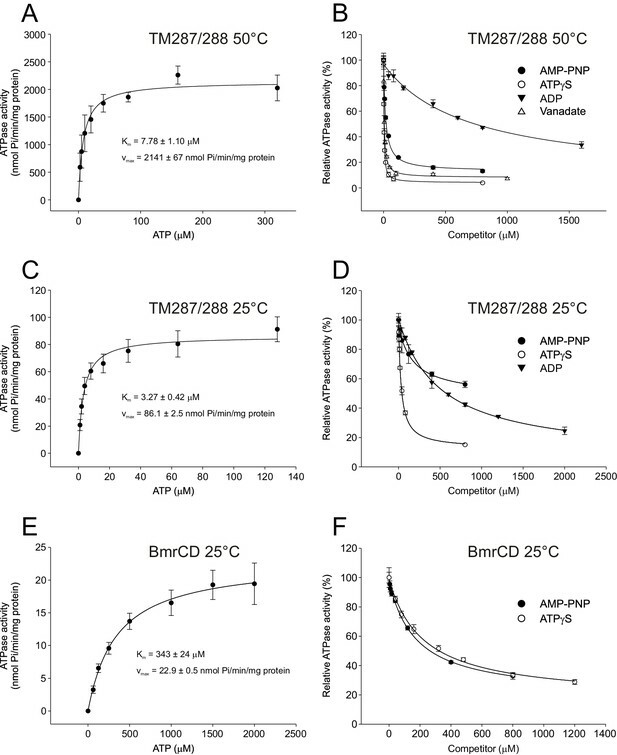 DEER analysis of wildtype BmrCD in the presence of 2.5 and 10 mM ATP. Q-band DEER trace [V(t)/V(0)] with the background fit (left), background corrected DEER trace [F(t)/F(0)] with fitted distribution function (center) and the corresponding distance distribution normalized to the area (right) for the spin-labeled pair 348BmrC/532BmrD in wildtype BmrCD. 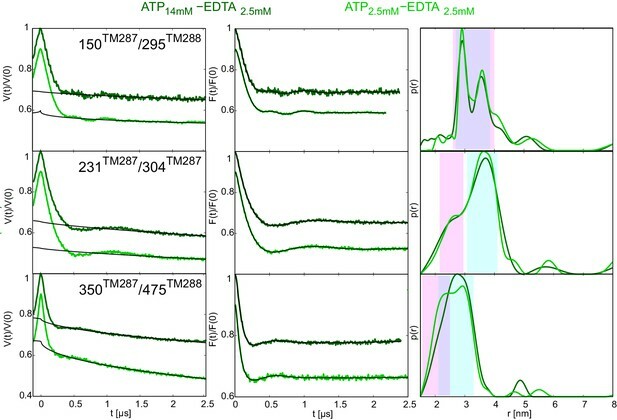 The light and dark green traces are obtained with EDTA 2.5 mM and 2.5 mM or 10 mM ATP, respectively. 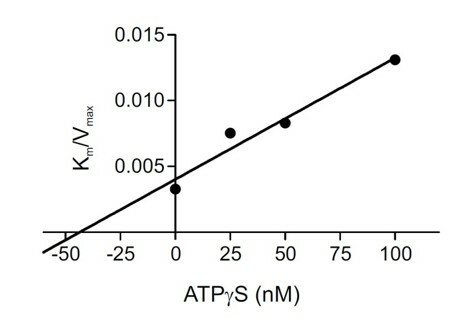 The light and dark red traces were detected in the presence of 2.5 mM or 10 mM ATP-Mg, respectively.